Article:Ryabov, Vyacheslav A. “The study of acoustic signals and the supposed spoken language of the dolphins.” St. Petersburg Polytechnical University Journal: Physics and Mathematics (2016). Fig. 1: Dolphins have been observed using tools, such as a sponge, to help them capture small prey items from the sea floor (Photo: SciFair). Fig. 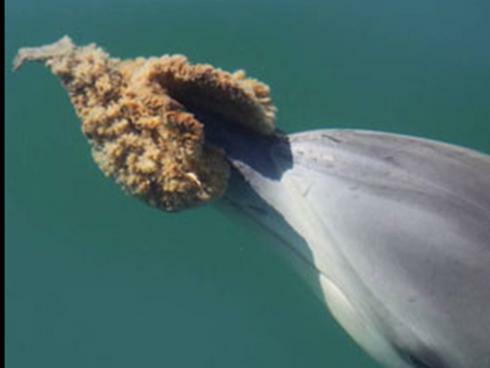 2: Dolphins have come up with creative ways of trapping small fish, including creating mud, or air, rings (Photo: capelookoutstudies.org). remained a bit of a mystery, but it has long been thought that the pulses are a social communication as they are typically observed when animals are very close to one another. These pulses, in combination with other acoustic signals, could point to very specific communication used by these animals. Recent advances in acoustic technologies have allowed researchers to study signals and communications of marine mammals with more precision and more breadth. While previous work on marine mammal acoustic signals has provided evidence of communication, many studies aren’t able to detect individual contributions to the soundscape. Here, researchers in Russia developed a technique to attribute specific sounds to specific individual dolphins. Having the ability to pinpoint when a certain individual is signaling can provide a look into the structure of conversation of these creatures! Fig. 3: Dolphins are highly social animals. Do they use language like humans do (Photo: blogiversity.com)? Fig. 4: Dolphins use sonar to help navigate and locate prey. These sounds are also thought to be used in communication (Photo: captseaweed.com). Researchers at a scientific station in Russia performed acoustic signaling tests on two adult Black Sea dolphins (Tursips truncatus). 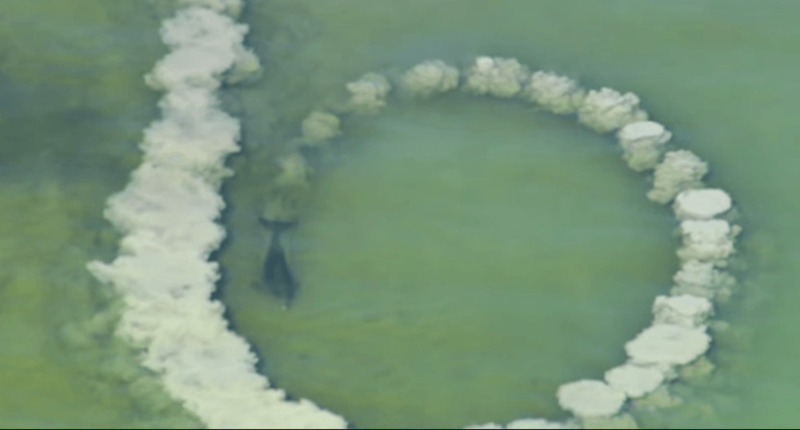 The two dolphins, one male and one female, have lived in the pool at the research station for 20 years. Here, the dolphins frequently swim to a walkway along the pool where they are fed. As such, the dolphins typically remain stationary while near the walkway (Fig. 5). Researchers placed a number of two-channel recording devices in the pool near the walkway. The signals registered were picked up by the closest device, allowing the researchers to determine which dolphin was signaling based on it’s proximity to a certain device. Fig. 5: This figure shows the pool set up (left, A) with numbers 3 and 4 indicating where sound receivers sit. 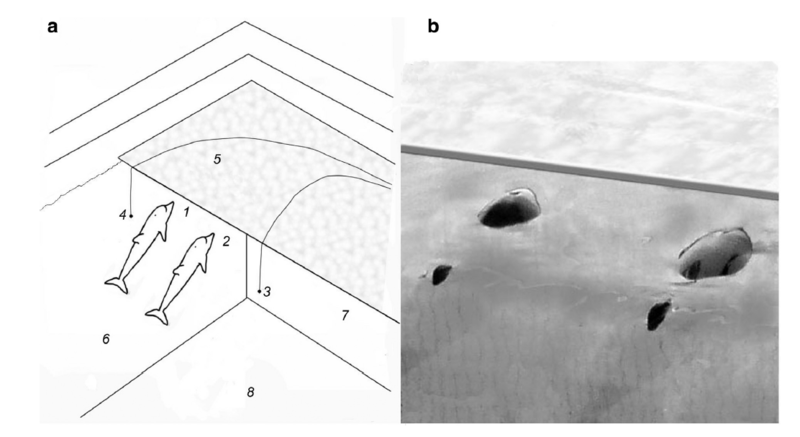 Dolphins remain relatively stationary when approaching the walkway (right, B) making it easy to detect which dolphin is making a certain sound. What researchers found surprised them. They observed conversations happening between the two individuals. When one dolphin would produce pulses, the other remained silent, listening. The two individuals would exchange pulses, while not interrupting the other (Fig. 6). In addition to observing conversation structure, researchers noticed that the pulses emitted all varied in their length and frequency. Here, each pulse was unique and not repeated, like saying different words. Fig. 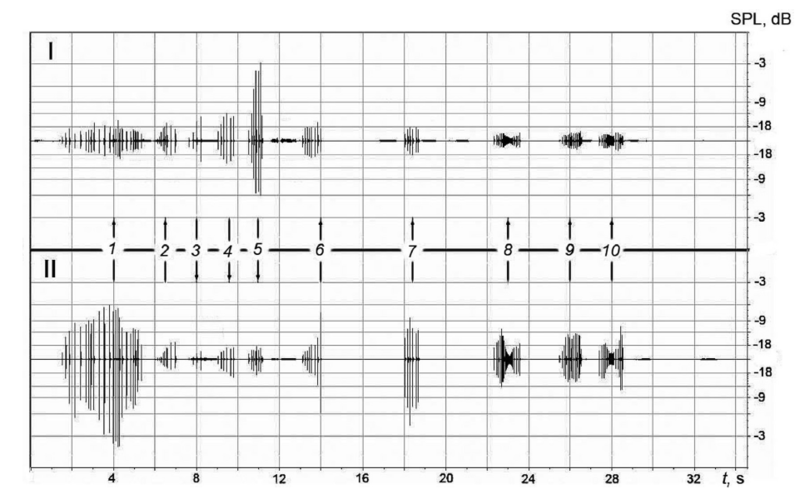 6: An example of what the sound recordings of dolphin pulses look like to researchers. I and II represent the different recording devices. Along the middle of the figure you’ll see arrows pointing up or down. The direction of the arrow indicates which dolphin is communicating. You can see that there are no overlaps in sounds produced by the two dolphins and distinct pauses before one chimes in. Human words are created by arrangements of phonemes (or a distinct unit of sound). Dolphins appear to use spectral extrema (extreme measures on the audible spectrum for dolphins) as their phoneme, but have the ability to produces the spectral extrema simultaneously (not like humans where we have to use one phoneme after another). As such, dolphin communications are short (0.25 milliseconds), and complex (as our ears are not equipped, in terms of time and frequency, for understanding the differences in dolphin speech). To hear what dolphins sounds like underwater, click here! 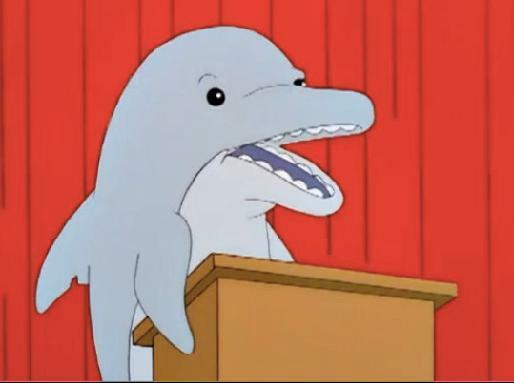 Should we prepare for our new dolphin overlords (Fig. 7)? Well not quite, but this research represents the tip of the iceberg in terms of humans communicating with animals. Here, with new technology and keen experimental design, researchers were able to show how specific individual dolphins talk to one another, how they use “language.” There is still a lot left to learn about marine mammal communication, especially with how complex these signals are, but this study shows that while there are a lot of similarities with human communication, dolphins have clearly figured out their own way of chatting. We may even want to take a page from their book as they seem to be a lot more polite than some of us! I am currently a postdoc at Keck Sciences, Claremont McKenna College. I work with Dr. Sarah Gilman, measuring and modeling energy budgets in intertidal species. I am a climate scientist and marine community ecologist and my PhD (University of Rhode Island) focused on how ocean acidification and eutrophication, alters coastal trophic interactions and species assemblages. I love bad jokes and good beer.